Deserts cover about one-third of the Earth’s land surface area. But the deserts of the world are much more than just the sandy, lifeless dunes of storybooks. The deserts found on Earth are extremely diverse, each unique in their own way. The dunes of the Saharan Desert, the icy tundra of Antarctica, and the Pacific coastline of the Atacama Desert are all deserts. That is right; they are all scientifically classified as deserts despite their differences. But it is quite simple, really, as they all share one common trait that qualifies them as a desert region: they all receive less than 10 inches (250 mm) of rainfall a year. 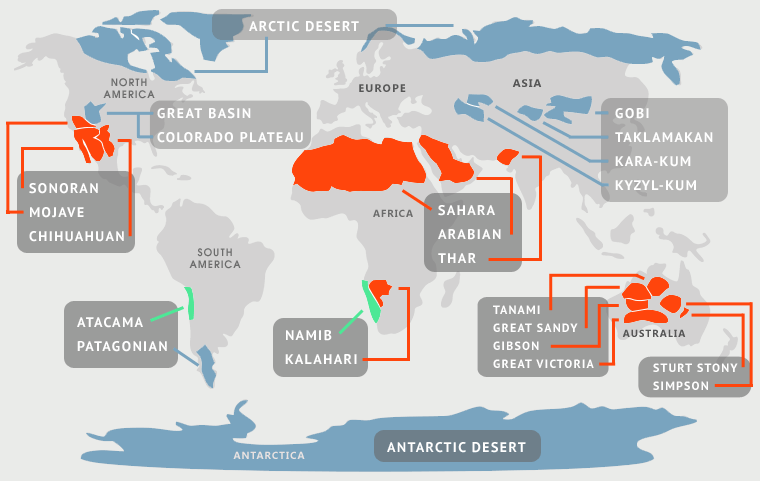 Because of the diversity of deserts under this definition, they have been split into sub-regions: Sub-Tropical Deserts, Cool Coastal Deserts, Cold Winter Deserts, and Polar Deserts. Australia is home to a wide range of desert areas due to its unique geographical features and climate. Two-thirds of the Australian continent is considered arid or desert, which makes the continent the driest on Earth after Antarctica. When you consider all the deserts of the world, Australia does not have the largest desert areas, but they do have the most desert areas of any continent when compared to the total continental surface area. There are 10 different deserts on the continent of Australia. Many are adjoining and some even overlap. They include the Great Victoria Desert, Great Sandy Desert, Tanami Desert, Simpson Desert, Gibson Desert, Little Sandy Desert, Strzelecki Desert, Sturt Stony Desert, Tirari Desert, and Pedirka Desert. Not all are covered in the following information due to their resounding similarities to each other. It is highly recommended that you use a satellite mapping tool such as Google Earth to review each of the deserts of the world in more detail! Don’t miss: 40 Interesting Facts about Deserts. Great information on the deserts. All in one place. Thank you! Do you have this map in PDF format that I could download, and print out for my children? Tons of information! Maybe too much? But its good information none the less. Incredibly robust resource! 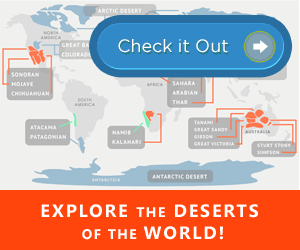 It was hard to find a place where you can learn about all the deserts of the world at once, but this site did it. Thank you for the help with my project!